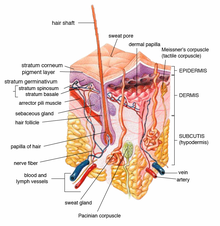 A cross section of human skin. In hyperhydrosis the sweat glands make too much sweat which then comes out of the sweat pores on the surface of the skin. Hyperhidrosis is a medical condition in which a person sweats too much. It is often caused by overactive sweat glands. People with hyperhidrosis may sweat even when it is cool and they are at rest. The sweat glands on any area of the human body can be affected by hyperhidrosis but it is usually happens more often in the sweat glands of the palms of the hand, the soles of the feet and the armpits. This page was last changed on 9 June 2014, at 20:14.